Gall stones are the most common disease of the gall bladder. A gall bladder is a small pouch situated at the under surface of liver which secretes a greenish fluid which aids in digestion called “ bile”. Technically we call this disease as “cholelithiasis”. About 80 percent patients remain without any symptoms and stones are incidentally found on abdominal scans done for any other reasons. It is not a cause of worry as surgery provides excellent results. Gall bladder stones can be divided into three main types: cholesterol, pigment or mixed stones. In Asia majority of them are pigment stones. 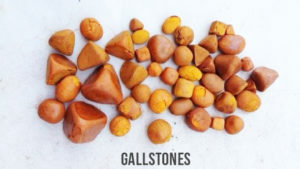 The process of gallstone formation is complex. Obesity, high-caloric diets and certain medications (e.g. oral contraceptives) can increase secretion of cholesterol. It can saturate the bile and add incomplete emptying of the gallbladder that causes these stones. Hence, the whole gall bladder has to be removed not just the stones to avoid inevitable recurrence of these stones. Symptoms include pain in upper abdomen, nausea and vomiting. Some patients may even have this for months with intermittent relief periods without any symptoms. Patients can come with acute symptoms which may warrant a surgery. The treating surgeon diagnoses it with an ultrasound scan. Earlier gall stones were worrisome causing jaundice due to lack of awareness and delayed approach to consult the doctor. Patients were made to believe that these stones can be melted. Unfortunately these stones unlike the urinary stones cannòt be melted or crushed into pieces and removed. Due to advent of new surgical laparoscopic ( camera) approache, patient can be easily discharged on the next day of surgery with a complete normal diet with minimal pain and small scars. Patients should approach nearest surgeon if they suffer from gall stones. It’s a completely curable disease.